When Studio Three broke ground on its first location in a historical River North building, we watched carefully as the team gutted the space, creating the trifecta of fitness: Interval, Cycle and Yoga. The painstaking detail they took on the space showed up in ways like thoughtful areas to congregate, spa-like locker rooms and the spot for after-class smoothies: Graze. And as the studio grew, it attracted fitness fanatics searching for a home packed with variety. Its members are people people who want to roll out their mats, sweat their faces off in the Interval studio, cycle their way through the fastest 45 minutes of their lives, or – gasp – do all three. To meet the needs of this growing tribe, Studio Three opened its Lincoln Park location at 2401 N Halsted (where Halsted, Fullerton and Lincoln meet). There you’ll still find gorgeous amenities, ample space to hang out, the three formats you’ve come to love, and – the newest addition – kids care. February 23, we’re taking over Studio Three Lincoln Park for a two part workout that will gain you access to the space. 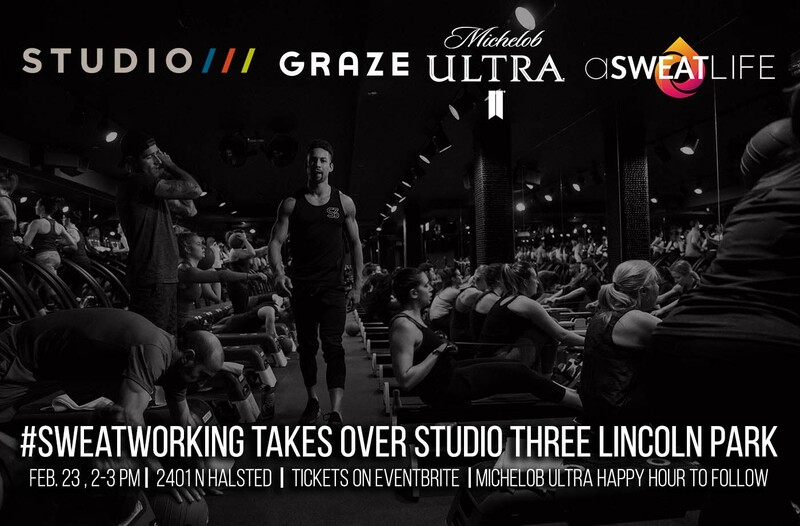 This Studio Three Lincoln Park experience will have a lot to love from snacks from Graze to perks to your sweaty workout (obviously) to a happy hour afterwards brought to you by Michelob ULTRA. You’ll take on condensed versions (30 minutes) of two class formats in the Interval Studio and the Yoga Studio. Studio Three’s signature TORCH class creates the perfect combination of intensity and efficiency using bursts of explosive exercises paired with active recovery periods. Our three-zone program delivers strength, power, and endurance all in one inclusive and immersive environment where you will continue burning calories post-workout. Expect Woodway treadmills, lots of ways to lift and slam things and water rowers to test your endurance. Studio Three’s Yoga Studio offers a variety of vinyasa yoga and specialized strength-training classes developed for students seeking to improve mobility and flexibility, increase strength, build endurance and develop a stronger mind-body connection. Their multi-level formats are taught in both heated and unheated environments in our picturesque, breathtaking yoga studio. Don’t worry about bringing a mat and a towel. Studio Three has you covered. To toast your hard work and a Saturday well spent, we’ll move to a nearby bar afterwards where your first Michelob ULTRA is on us! Consider this the official kick-off to the weekend. When? February 23 at 2:00 pm. We’ll start to check you in at 1:30 pm. The fitness portion of the event will be complete at 3:30 pm and the happy hour will conclude around 4:30 pm. What? You’ll get to take a look around the Studio Three Lincoln Park studio, getting sweaty in two of the class formats in the Interval studio and the Yoga studio. How do I sign up? Right here! And remember, booking tickets with a friend saves you $5 per ticket.